If the latest variation on "Google Glass" works out as well as its developers and producers hope, you may be seeing construction workers and architects wearing some very funny looking sunglasses. Microsoft's HoloLens, the product in question, is the latest generation of what is best described as a "wearable super computer". Much like the much talked about Oculus Rift, a wearer secures the device to his or her head, and looks through and responds to images he or she sees. But whereas Oculus Rift is a self-contained device that immerses its user in a virtual reality (VR) world, the HoloLens deals in augmented reality (AR). Augmented reality is defined as "computer-generated sensory input", appearing over fixed real life images. That science fiction movie where characters suddenly call up a mid-air streaming video newsfeed in their living room? Or suddenly insert a 3-D user's guide over the spaceship part that they're trying to fix? That's AR in action. But AR isn't just the stuff of fiction any more. This technology has been with us for awhile, and car manufacturer BMW has actually been using AR at some of its assembly lines and in other manufacturing areas for the last couple of years. And Microsoft has begun an aggressive push to interest the U.S. military in the maintenance and engineering possibilities of AR. Because this device is hands-free and wireless, designers in many industries are interested in its possibilities. And as this video shows, the ability to insert designs with in-progress work could make AR very beneficial on construction projects, as could the ability to call up 3-D floor plans, instruction manuals, and other documents from any location. But before you authorize that intern to run down to the electronics store and pick up a few pairs for your firm, a few cautions. Not only is this technology costly at $3,000 a pair, Microsoft is currently only making it available to application designers. 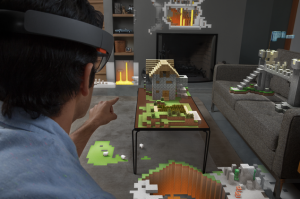 The company has not indicated when the HoloLens will be available to the public at large. Technology experts invited to field-test the device say that while the viewing experience is "magical", the device is many months away from release to the public. Design problems include difficulty in activating it, and disappearing and reappearing AR images. So while it will probably be years before one mistakes a construction site for a scene from Star Trek, the HoloLens has definite potential as a construction tool in terms of design, maintenance, and documentation. This Hololens for construction is a technology whose progress managers should follow.